However, it’s important to be aware that there are criminals who sometimes try to take advantage of the elderly online. They assume seniors are easy targets because they lack tech savvy, but fortunately there a few simple precautions you can take to protect yourself while you enjoy everything the Internet has to offer. Don’t trust anyone who asks you for your personal information via email, even if they appear to be a bank or trusted company. Most reputable companies will not ask you to update information like your social security number or credit card information via email. Instead, you will need to log in to their secure website to manage your account online. Don’t open files attached to emails if you don’t recognize the sender. Even if the email looks like it’s from a trusted institution, like the FBI, a loan office, a lottery site, or a charity, you don’t want to accidentally download a virus, spyware, or malware that could send personal information on your computer or in your email account to a cyber criminal. Trust your gut. Just like you have smart instincts about protecting your social security number, bank PIN, or credit card information, or if someone out and about gives you a bad feeling, you can also get a sense for if someone’s online activity is suspicious. The anonymous nature of the Internet makes it easier for people to hide who they are and their real intentions, but just remember that if anything seems to be too good to be true, or is trying to play on your best qualities of generosity and compassion, someone might be trying to set you up for a scam. When in doubt, ask a trusted family member or legitimate business that sells or repairs computers. 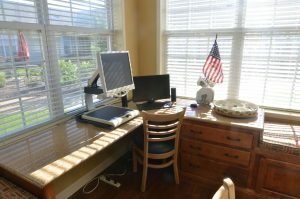 You might try Spotts Professional Computers in Jackson, Best Buy, or an Apple Store in Memphis or Nashville, like the one at Saddle Creek in Germantown. And just remember, there are so many amazing reasons to join the millions of seniors who are getting online. Don’t let the possibility of cybercrime prevent you from getting to join your family for little moments via Skype, enjoy free news articles online from a variety of publishers and channels, save money on shopping, or finding out about even more of the exciting things to do in your city or region. With these few simple steps, you can enjoy a bigger, broader world!